I have some words/phrases that are familiar and others perhaps not so. Enjoy the origins of these choice tidbits. Butterfingers: (Phrases.org) A name playfully applied to someone who fails to catch a ball or lets something slip from their fingers. Several authorities Charles Dickens invented the compound word “butterfingers.” Dickens used the term in The Pickwick Papers (more properly called The Posthumous Papers of the Pickwick Club), 1836: At every bad attempt at a catch, and every failure to stop the ball, he launched his personal displeasure at the head of the devoted individual in such denunciations as ‘Ah, ah! – stupid’ – ‘Now, butter-fingers’ – ‘Muff’ – ‘Humbug’ – and so forth. The British Library’s database of 19th century newspapers turned up a reference to ‘butter-fingers’ in the Yorkshire newspaper The Leeds Intelligencer dated May 1823. Pre-Pickwick, clearly. Looking closer, it appeared that the writer was quoting from what he called ‘a scarce book’, The English Housewife, a book written by the English writer Gervase Markham in 1615. Markham’s recipe for a good housewife was: ‘First, she must be cleanly in body and garments; she must have a quick eye, a curious nose, a perfect taste, and ready ear; she must not be butter-fingered, sweet-toothed, nor faint-hearted – for the first will let everything fall; the second will consume what it should increase; and the last will lose time with too much niceness. The Salt Lake Tribune reported on a sports team in May 1899: ‘The Butterfingers will cross bats with the Salt Lake Juniors at Calder’s Park Tuesday’. A “tale” found often upon the internet is this one repeated on Word Detective: The Reverend Dr. E. Cobham Brewer, author of the original Brewer’s Dictionary of Phrase and Fable in 1870, included an entry on “pin money” which read: “Long after the invention of pins, in the fourteenth century, the maker was allowed to sell them in open shop only on January 1st and 2nd. It was then that the court ladies and city dames flocked to the depots to buy them, having been first provided with money by their husbands. When pins became cheap and common, the ladies spent their allowances on other fancies, but the term pin money remained in vogue.” Brewer had an unfortunate tendency to repeat fables, but in this case he was likely on solid ground. Apparently, pins were sufficiently expensive and in such short supply in the 14th century that Parliament actually passed a special law that indeed restricted their sale to the first two days of January each year. In fact, until mass production in the 19th and 20th centuries, the common straight “pin” (from the Latin “pinna,” feather, specifically its sharp point) was much more expensive than it is today, and more useful in the typical household where clothing and cloth furnishings were more apt to be sewn than bought. It is also true that from the 16th century on, husbands were expected to give their wives an allowance (referred to as “pin money”), usually a substantial amount, with which to buy clothing and manage the household. The amount and terms of the “pin money” were often written into the marriage contract, and the legal status of “pin money” was codified in English law. Such “pin money” was often the only actual cash the wife received from her husband, was considered her personal property, and served as a sort of safety net at a time when women had few legal rights. There were even legal cases where, upon the death of the husband or dissolution of the marriage, the wife was awarded “pin money” that she was owed (“On difference between him and his lady about settlement of 200 l. per annum, pin-mony in case of separation, she upon affidavit of hard usage, and that she went in fear of her life, prayed security of the peace against him, which was granted,” 1674). “Pin money” was never intended to be spent entirely on pins, no matter how expensive they might have been; the term was simply verbal shorthand for “household allowance.” What’s interesting about the term “pin money” is that it originally meant a hefty chunk of change. But with the dramatic fall in the price of pins, a literal interpretation led to “pin money” becoming synonymous with “a trivial amount of money” or “petty cash”. Photo of Military Collectible, Antique Sewing Kit, Sewing Kit, Housewife, 1943 – http://shoplylive.s3. Gerri B. asked me about the word “housewife” in one of my previous posts. I did find a bit of reference in how she used it, but not as much I would like. 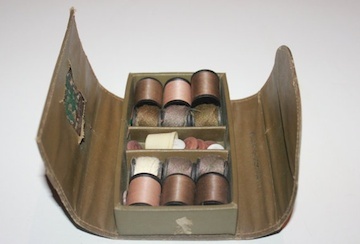 A “housewife” is the name for a simple sewing kit carried by soldiers. They were carried by both British and U.S. soldiers in the past. **1749 P. Skelton Deism Revealed viii. (T.), Women..spending their time in knotting, or making an housewife. **1762 Sterne Tr. Shandy V. xvi, To bring whatever he had to say, into so small a compass, that..it might be rolled up in my mother’s housewife. **1768 ― Sent. Journ. (1775) I. 112 (Temptation) [She] without saying a word, took out her little hussive, threaded a small needle, and sewed it up. **1851 D. Jerrold St. Giles xv. 158 He placed a little silken huswife in her trembling hand. **1868 Holme Lee B. Godfrey x. 54 She drew a thread of silk from the housewife. **1871 Carlyle in Mrs. C.’s Lett. I. 161 She tried anxiously all her ‘hussives’, boxes, drawers. Merriman Webster defines “Humdudgeon” as (1) Scottish : a loud complaint or noise <the auld carline went … on top of her head, making such a humdudgeon — Hugh McCrae>; (2) Scottish : an imaginary illness or pain. World Wide Words offers this explanation: “A Scots word of eighteenth-century vintage, it has appeared infrequently but usually to refer to a depressed state or to what Philip Howard once described in Winged Words as ‘meaning something like accidie or being down in the hypochondriac dumps’. That it has also been glossed as an imaginary malady and a needless fuss about nothing probably reflects the view of earlier generations about mental illness. Hum Durgeon, an imaginary illness; he has got the hum durgeon, the thickest part of his thigh is nearest his arse, i.e. nothing ails him except low spirits. Dictionary of the Vulgar Tongue, by Captain Francis Grose, 1785. February 26: At home, and settled to work; but I know not why I was out of spirits — quite Laird of Humdudgeon, and did all I could to shake it off, and could not. February 27: Humdudgeonish still; hang it, what fools we are! I worked, but coldly and ill. Yet something is done. I wonder if other people have these strange alternations of industry and incapacity. I tell you, Uncle Bill’s always agreeable. It’s Buckle who’d put a spoke in the wheel — sour old cheesebox — but it’s the luckiest thing in the world, he’s been called away to Deptford on two days’ urgent private business — rich aunt dying or some such humdudgeon — and won’t be back till tomorrow evening. The Oxford English Dictionary defines “animadvert” as (animadvert on/upon/against) to pass criticism or censure on; speak out against. Late Middle English (in the sense ‘pay attention to’): from Latin animadvertere, from animus ‘mind’ + advertere (from ad- ‘toward’ + vertere ‘to turn’). Again, we can find this word in the entries from World Wide Words. “Only a writer with an extensive vocabulary and the confidence to make use of it without sounding a prat will venture this verb. One such is the British journalist and author Will Self, though he says that he started using big words because he felt insecure. Ralph imagines a conversation between Marcel Duchamp and Luis Buñuel, in which the venerable — and now, quite dead — Surrealists animadvert on the relationship between chance encounters, narrative and destiny. Will Self in the Independent, 5 Jan. 2008. “His boldness is the more striking because he’s using animadvert in a way that’s considered obsolete — to comment upon something. Dictionaries say the only current sense is to criticise or pass censure on someone or something. This shift in sense parallels that of criticise, whose standard sense less than a century ago meant to judge the value of a work, a view that might be either positive or negative. Though that survives in literary and similar criticism, our carping age permits everyday criticism to be solely censorious. Those rare persons who — at the risk of sounding pompous — animadvert or create animadversions do so to disapprove. “The verb is from Latin animadvertere, to notice something or remark on a subject. It was created from animum, the mind, and advertere, to pay attention, hence to turn one’s mind to something. Even two thousand years ago, the Romans were using animadvertere to mean (adversely) criticise or even punish, so it’s surprising that animadvert ever had a neutral sense in English. Its second element is the root of advertise and advertisement, which at their most neutral contain the idea of making something known. “Flanked by an animadvertisement for deodorant pills and by a poster for Altars 0f the Heart, a newsscreen showed me its dormant glassy face. First Known Use: 1734. It is a thin strip of wood, cardboard, or plastic, esp. one used in the game spillikins. (1.) spillikins (used with a sing. verb) The game of jackstraws. (2.) 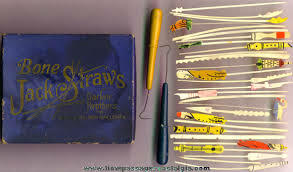 One of the straws used in playing jackstraws. Early Boxed Parker Brothers Bone Jack Straws Game http://www. Definition of JACKSTRAW: (1) plural but sing in constr : a game in which a set of straws or thin strips is let fall in a heap with each player in turn trying to remove one at a time without disturbing the rest; (2) one of the pieces used in the game jackstraws. The first known use of “jackstraws” was in 1801. “Spillikins or Spellicans has been played all over the world for centuries and is thought to have originated in China. The game has different names in different countries. In the UK, it is often known as Pick-Up Sticks while in Europe it is generally known as Mikado. It is also called Jackstraws in the USA, Jonchets in France and Chien Tung in China. chil(l) + blain ; from Old English blegen, a sore ; from Indo-European an unverified form bhlei– ; from base an unverified form bhel-, to blow up, swell from source ball.” The Oxford English Dictionary gives the origin as Old English cele, ciele ‘cold, coldness’, of Germanic origin; related to cold. This entry was posted in American History, British history, Great Britain, Uncategorized, word play and tagged origin of words, unusual phrases, word play. Bookmark the permalink. 3 Responses to Do You Know These Words and Phrases? Thanks for sharing, Wendy. I had no idea of your condition. Most people don’t know about it. They just think that I have funky fashion sense all year round! I wore arm warmers before Claire Fraser in Outlander! LOL It is interesting how much Chilblains sounds like Raynaud’s.